You know what "spin" is, right? Spin is a biased interpretation of something to favour one side or the other. You get spin when someone uses an interpretation of an event or information in order to modify the perception of an issue or event, particularly to either increase or decrease any negative impact on opinion. Some people think it is only comes from public relations people. But never the news media. Spin happens in many places since you can find all sorts of people interpreting things in a way that favours their pet position or that harms an opponent. Tek, for example the number of people - especially in politics - who have been running around the past few weeks saying that Dwight Ball is the third most popular premier in Canada. They are mostly Liberals and they have been furiously retweeting that idea. But that's spin. Pure and simple. Except it didn't come from the Liberal Party. Well, where did it come from then? The information the idea is based on came from an Angus Reid poll. The opinion research company asked a sample of Canadians in every province except Prince Edward Island what they thought about the local Premier. In Newfoundland and Labrador, 42% gave Dwight Ball a favourable rating. In a chart Angus Reid used to illustrate the story, they showed the approval ratings from highest to lowest, left to right. There's Dwight Ball, third from the left, which is third from the top. Angus Reid was careful to describe their results fairly and accurately. After noting that only two Premiers actually had the support of a majority of those polled in their province, Angus Reid said this about Dwight Ball and the rest of the Premiers who - take note - had a majority who *dis*-approved of their performance. 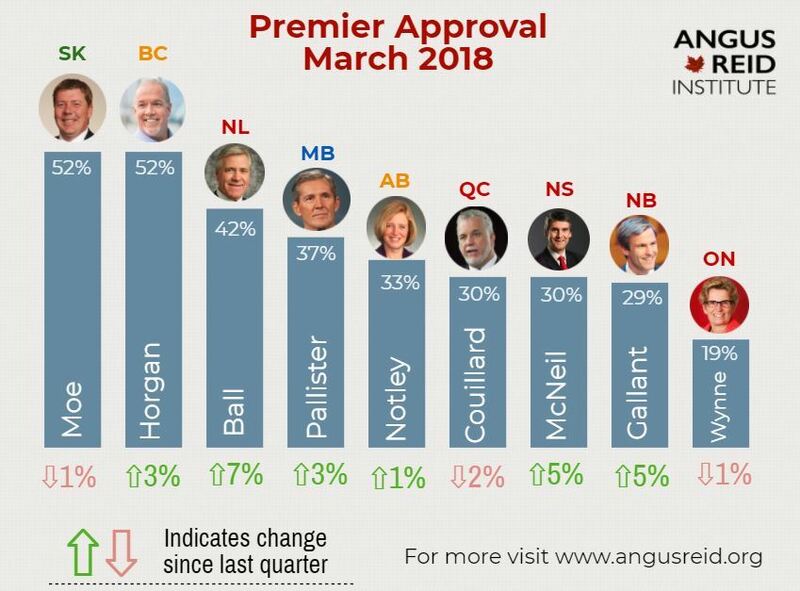 Out of every five people surveyed by Angus Reid, two approved of Dwight Ball's performance as Premier. In fact, if you click on the link to get the full results from Angus Reid, you find that 49% of respondents disapproved of Ball's performance and only 10% had no answer. So where did this "third most popular" idea come from? 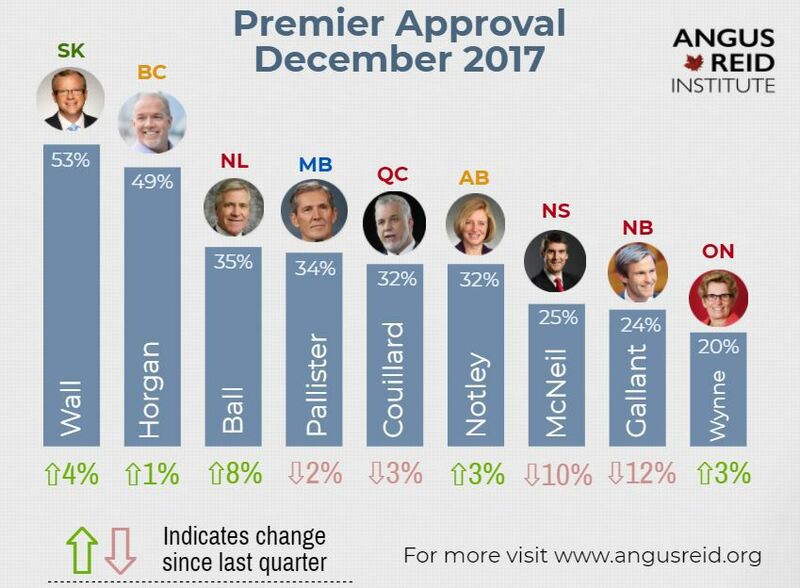 CBC ran a story that had as its headline "Dwight Ball 3rd most popular premier in Angus Reid poll." The front end of the story focused on the change in Ball's approval over the past year, which is accurate, but ended up with the "third-most-popular" claim. At the end of the story, CBC tossed in a completely unrelated fact that in a Corporate Research Poll 41% of respondents said they would vote Liberal, as if the similarity of the two numbers was enough to connect two different questions (job approval versus party support). In Newfoundland and Labrador, they are two very different questions, as CRA's polling has shown. Support for Ball and the Liberals has not been tracking the same over time. Ball's actually been behind his party in popular support for a chunk of the past year. Didn't like the leader. Would vote for the party. Not an unusual response at all, but the two things are not synchronised. The leader and party questions are separate. That's why it was a problem for CBC to muddle the two together. Saltwire - that is, the Telegram and its family of papers - ran a headline that Ball had seen a jump in his approval, which is true, and used the "third-most popular premier" as it's sub-head. The story quoted Angus Reid word-for-word on the bit about two-in-five respondents but you had to read down a way to get to that. NTV's story referred to Ball as the premier with the third-best rating. 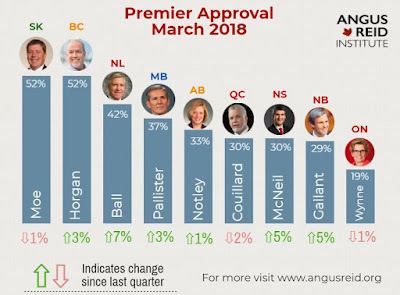 Their report on the previous Angus Reid poll, in which Ball's position relative to other Premiers was identical, notes merely that his position improved over time. That poll-over-poll improvement is noted in all the stories and it is probably the most accurate way to describe the results. VOCM also reported Ball was the "third most popular" Premier in the country. No one in either of the four newsrooms checked the full poll result. None of them even did the simple logical inference that if 42% approved of Ball, then the rest didn't. They certainly didn't notice that 42% was less than half. Instead, they just looked at the same chart they saw the last time from Angus Reid (below) and picked the "third-most popular" as their headline. They also didn't notice the size of Dwight Ball's change is quite large and that it was large for the second time in a row. look at Nova Scotia and New Brunswick and you will see similar big jumps in a relatively short span. A 15 point jump in six months is pretty steep in a province where there's been no similar major shift in public opinion detected by any other polling firm. Might be a problem with the poll. Ball is third most popular. Only two Premiers had a majority support and could be reasonably considered popular. Seven Premiers all had more residents who didn't approve of their performance, which seems to be a bigger part of the overall story. Angus Reid presented its information that way. You could have reasonably focused on the fact Ball's rating had jumped again by a fairly hefty amount even if the back to back big jumps look dodgy. But to say he is the third most popular is... well... wrong. If you want to know how people are misinformed, there's a really fine case study. No conspiracy. No collusion. Apparently, not even an organised effort by the government officials of the type we used to see in this province between 2003 and 2010 to control the flow of information, to influence media stories, and manipulate public opinion. Just a bunch of people who all got the story wrong in exactly the same way. Some might would argue that spin has to be a deliberate choice but frankly, that's just spin. Truth is that spin is a form of bias. There are all sorts of biases. Something like a shared perspective among people doing the same sort of work in a small place can cause a wrong interpretation of events to reinforce itself. After all, the folks in the local newsrooms all keep an eye on each other during the day. They talk among themselves. Once the first story hit the air and the others heard the same general line, they would inevitably confirm their interpretation and get on to the next task. Except, they all got it wrong.